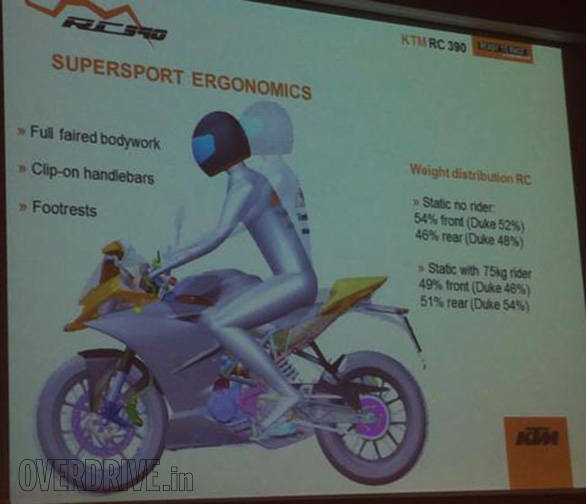 The KTM RC 390 has been seen in many motor shows over and over and its shape, at least is no surprise. 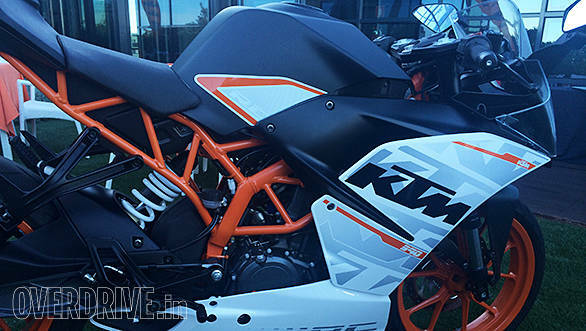 But how is this motorcycle, rumoured to be inspired to the hilt by KTM's Moto3 racing motorcycle up close? We got a good look at one before we headed out to ride it (story soon) and here's what we spotted. These are neatly integrated into the lip that sticks out from under the twin projector lamps. Up close, you will notice a lighter, translucent grey colour which houses the LEDs which are shaped like a set of squared off tick marks mirrored in shape, next to each other. 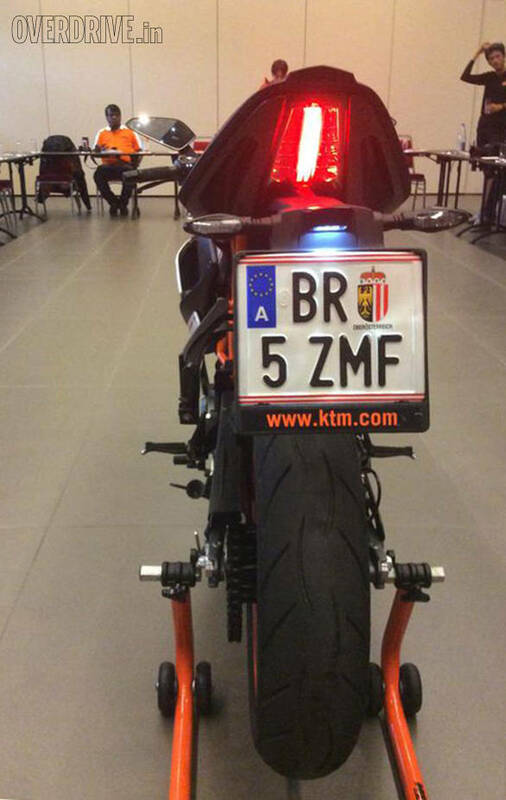 Would you call the RC390 a pretty motorcycle? I certainly would not. But there's a certain muscular brutality to the lines which is quite arresting when you look at the motorcycle up close. 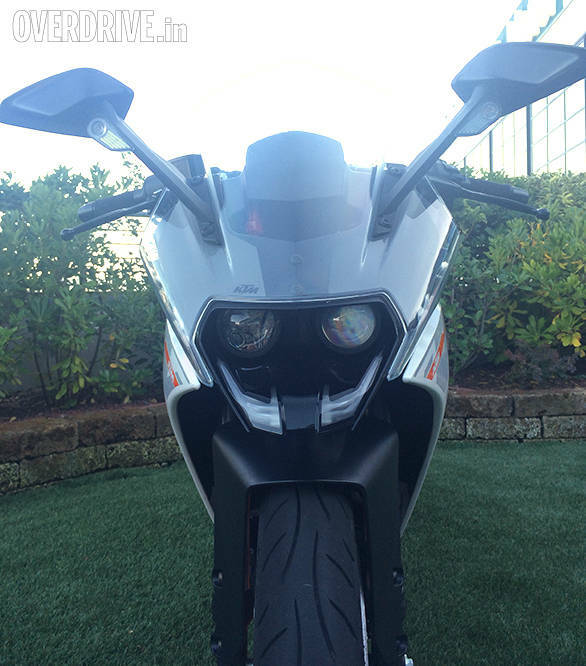 This is one of those motorcycle that would look menacing in a dark, matte-black sort of theme. The sort of bike baddies in the movies will ride with panache and a certain atmospheric ominous tinge to the scenes. 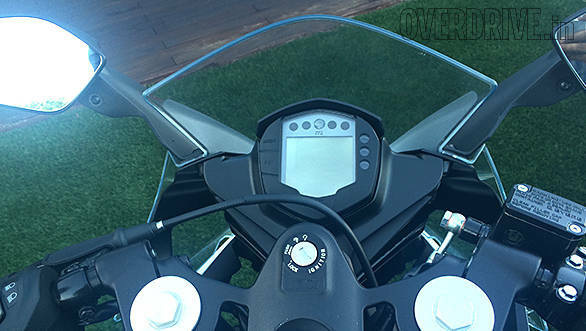 Where the 390 Duke has a rather shapely front mudguard, the matte black job on the RC is almost hidden by the headlamp's lip. But if you look close, you'll see an industrial looking squared off job that comprehensively shrouds the front forks. I am guessing in the Indian real world, this means the travel part of the 43mm upside down fork will receive more protection on the move. On the other hand, I rather like the way it looks and since the bike promises to have a top speed of 170-175kmph, has aerodynamic purpose as well. 4. That top triple clamp. . .
. . .looks terrific with the sculpting and the holes in the metal. It makes the motorcycle look upmarket and expensive though it clearly isn't - by design. Still look cheap, unfortunately. We know that they work, but not having a red engine kill switch and basic looking levers lowers the premium perception of the bike a bit. Pros? It all works and you get the chance to bring in some cool anodised aluminium levers later on. Cons? They look run of the mill while the rest of the motorcycle clearly does not. The RC sticks with rubber topped units like in the 390 Duke but the subframes for both the rider and the pillion are new and the whole ergonomics package has changed - more on this when I ride the bike. I did notice that the subframes look surprisingly chunky in the flesh and I wonder why that is because the thickness suggests robustness but is disproportionate to the rest of the bike which is pretty lithe to look at. Is a marvel of design and styling. 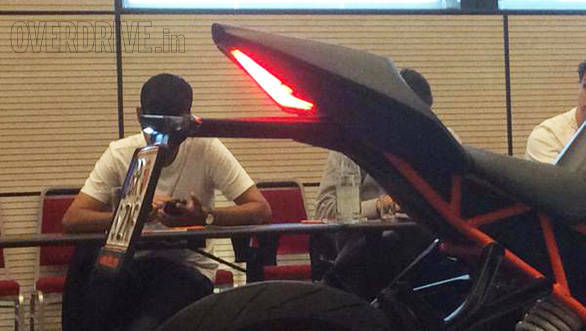 It looks just like a matte black cowl on a single seater sportsbike but is foam topped so is actually the fully functional pillion seat. 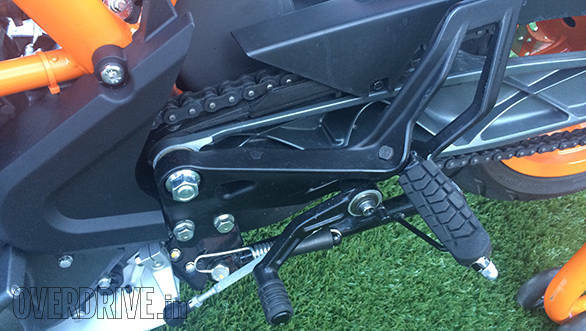 I expect to see some modifications when the Indian RC appears because we have to have rear grab rails by law.